On Tuesday, the Boynton Beach, Fla. police department released two student-shot cell phone videos that show police officers detaining two sixth graders who’d reportedly just been removed from a school bus. In one video, an officer appears to put a student in a chokehold; in another, an officer kicks a student in the back of the leg, causing the student to fall. The boys were reportedly pulled off the school bus for some minor behavioral issues, when police arrived. One boy was initially handcuffed and sat on the ground, while police handcuffed the second student. 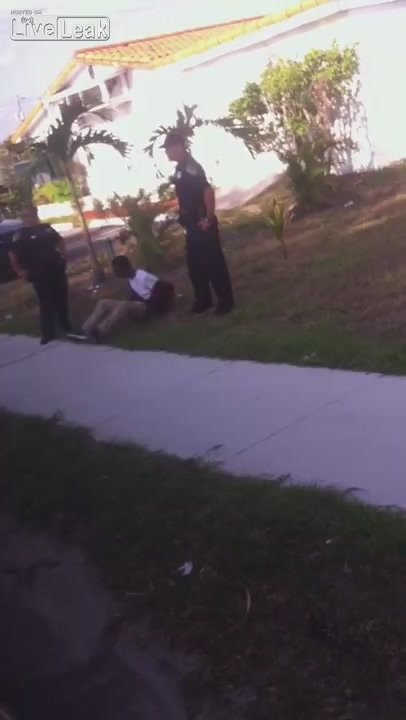 In the first video, the student standing with the officer on the left of screen is allegedly roughly detained.